Team CFRX wins the ATL Affiliate League…again! NOTE: 4 min. Tabata interval for each movement. 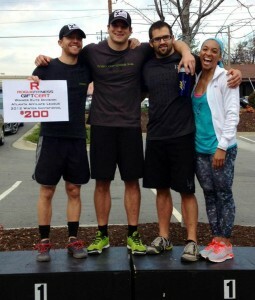 Way to go team RX!!!! Jan 7, 2012, my little nieces birthday(remy) will be my one year. I have until then to do a muscle up or there is a 365 burpee penalty each day after that I fail to get one. I have no doubt you will get it. With your determination, that muscle-up doesn’t stand a chance of beating you. Jan 26th is the due date! We will see when he/she decides to make an appearance! You’ll get it! You’re a LEVENS, and Levenses are bendy gymnasts. They can do all kinds of crazy things! Amy – you’ll get that muscle up. Want me to bring the shot glasses? But I’m also with Brittany, to me, you’re just about perfect at everything else!! Though once my shoulders are better, I’ll train with you to get that MU. Today I modified again with front squats & ring rows. I’m a front squatting maniac! I’m sure you’ll be coaching the rest of us on these in roughly a week. You’ll get it!! 🙂 Preston, Joey and Michael were lots of help when I was first learning….so ask them for advice. Well you can do everything else just about perfect! i think you are ok.
You have to do one to, lady! What is a jumping muscle up? Interesting wod. I did pull-ups instead of MUs. Worked up to 115# PC and stopped increasing after I missed a few. Not a true 2 RM but it felt good and heavy. For the tabata mash-up, I did air squats (144), pushups on paralettes (64), and plank holds. Great turn out at 6:00a.m. today .. Worked up to 125# PC; did a few bar muscle ups at the beginning them switched to pull ups. Total of 173 between the v-ups and hollow rocks. Up to 135# on power cleans and took the 5 (banded) pull up option. 78/28 on V-ups/HB rocks. Great to be back after a week in meeting land. This was HARD. 135# and a mashup of bar muscle ups and pull ups. I totally dropped the weight a couple times because I got cross fit brain and forgot they were supposed to be touch and go. Whoops! Fun at 4pm with all the women. I worked up to 80# power cleans and used red, then lavender, for pull ups. Tabata was painful but needed. Amy Levens will get a muscle up soon! Make your bro or soneone practice with you! 140/145# PCs. Got muscle ups for 10 rounds but there were none left in the tank after that. Pull ups for rds 11 & 12. May I suggest workout hero? It’s already got all the Girls and Hero WOD’s in there, and an extra section with timers, how-to videos, and ebooks for download. Did blue banded bar muscle ups for 7 rounds and then after 2 failed attempts at 8 I went to pullups. did 170ish for v-ups and hollow bodies lost count after 150….i got crossfit brain too.